A speed and recreational club for skaters in Vancouver, Canada. Includes a photo gallery, links to skating events, and information about the Vancouver Skate Patrol. An informative history of skiboarding and basic information on getting down the hill in one piece. Intensive ski instructor courses and leadership training programs in the Comox Valley of Vancouver Island on Canadas West coast. Athletic club includes training and coaching information as well as a meet schedule. Offers kayaking trips on Vancouver Island. Trips, rentals, outfitting, lessons, guides, and contacts. Fastpitch organization located in Vancouver, Washington. Locations of schools in Vancouver, British Columbia, Canada. Vancouver track hosts the largest Canadian motorsports event, the Molson Indy Vancouver. A five sheet facility in Vancouver British Columbia. News, event listing, and contact information. League listings, available practice sites, photo gallery, where to play pick-up games, and relevant links for Vancouver. Instructed by Miles Tulloch. Includes introduction, instructor, photos, class dates and related links. Based in Vancouver, BC. Fields mens, womens and junior sides from its base at Klahanie Park in West Vancouver, British Columbia. Includes team and club information, schedules, results, maps and history. Information, tips, and news about the 2010 Vancouver and Whistler Winter Olympic Games. Official website for the Vancouver, British Columbia, Canadians minor league baseball team. A directory with links to a large number of Vancouver Canucks sites. Updated regularly. A page of original pictures of the Vancouver Canucks players. Perspectives of an Oilers fan living in Vancouver, home of the Canucks. Vancouver, British Columbia, CA - International Rules. The largest club in BC. Largest field hockey club in North America provides information on coaching, umpiring, and volunteering as well as resources for players. This private club offers an eighteen hole championship course in Vancouver. Discusses the club, the course and services. Focused on several players who were with the team in Vancouver. A recreational league on south Vancouver Island, British Columbia, comprised of a number of over 40s and over 50s teams. Jan Nekolnys inline skating school in Vancouver, Canada offers group and private lessons. Includes prices, locations, and an online booking form. Rhythmic gymnastics club in Vancouver, British Columbia, Canada. Newly formed west coast league that includes teams from Minnesota, Bristish Columbia, Vancouver, Edmonton, Calgary and Saskatchewan, Canada. Website includes news and information on all participating teams, game results, statistics and photos. News on the Vancouver Canucks continually updated from thousands of sources around the net. If the business hours of West Vancouver Track and Field Club in may vary on holidays like Valentine’s Day, Washington’s Birthday, St. Patrick’s Day, Easter, Easter eve and Mother’s day. We display standard opening hours and price ranges in our profile site. We recommend to check out westvantrack.com/ for further information. 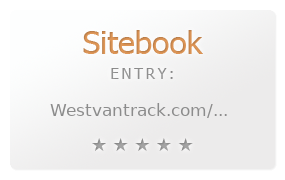 You can also search for Alternatives for westvantrack.com/ on our Review Site Sitebook.org All trademarks are the property of their respective owners. If we should delete this entry, please send us a short E-Mail.